This is another photo of a male Red-winged Blackbird. The Red-winged Blackbird is omnivorous and feeds primarily on plant materials. It also eats insects and other small animals. It can be very aggressive while defending its territory and it can be seen attacking much larger birds, such as birds of prey and herons. 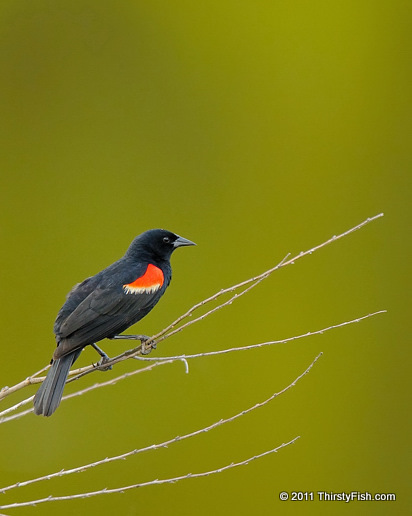 The Red-winged Blackbird is a songbird that is abundant throughout North America. Red-winged Blackbirds are polygynous with males defending up to 10 females. Blackbirds were instrumental in the development of the "Polygyny Threshold Model" which seeks to explain why a female would select a male that already has a mate? Experimental Findings seem to indicate that females choose already-mated males with over-water nesting sites in preference to males with less desirable territories, because the reproductive cost of polygyny is offset by the reproductive success gained through a superior nesting territory. In simple words, female blackbirds have a biological bias towards males that can provide for them. If we temporarily put aside the legal definitions of marriage, and look at polygyny through the perspectives of evolutionary psychology and biology, we will find that monogamy is less common than we idealize it to be. Many technically monogamous men are de facto polygynous because they support of short or long term companions or mistresses. Polygyny is indeed paradoxical.